For $399, you too can realize your dream to become a whole hog pitmaster. You can crank out a superb whole roasted pig in 4 ½ hours. Read my tricks and tips to get the most out of it. This is not a one person cook. You need a helper to keep it safe and to have a successful outcome. Just like some folks like owning and driving different sports cars, I enjoy cooking on different barbecue pits. One bucket list pit I always wanted to cook on was a whole hog Cuban pig roaster. There are a couple of companies who sell them and I bought one online for $399, shipping included, from La Caja China, a Florida based company with Cuban roots. When I posted on Facebook that I was trying out a Cuban pig roaster, many asked if I liked it and if I could write a review and share what I did. Some were even concerned that I might be abandoning my trusty Weber Smokey Mountain 18 inch smokers which I had used to win over two dozen grand championships. No fear, I’m not going to be able to use this pig roaster in competition because, as the name implies, it’s a roaster which uses radiant smokeless heat so it does not work like a smoker which uses both heat and smoke. Nevertheless, it cooks a whole hog beautifully but you need to still have pitmaster-level cooking skills so I’m sharing my tips on how to get the most out of it. Remember, how your Q turns out is always dependent on the Pitmaster and never about the Pit. 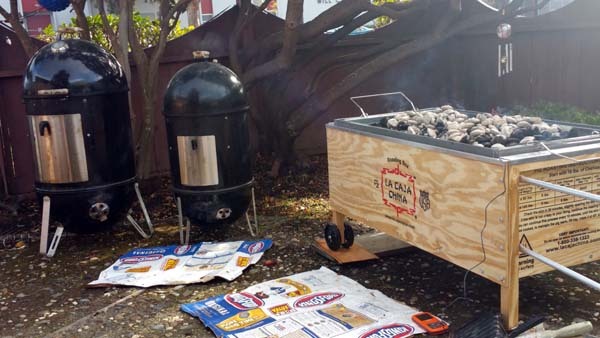 For example, I have many other pits and I’m pit-agnostic as I teach my barbecue classes with other pits including Kamado, drum, pellet, kettle, and gas smokers. This blog post is intended for you if you’re considering buying one or already have one but wanted my field tips on how to get the most out of it. 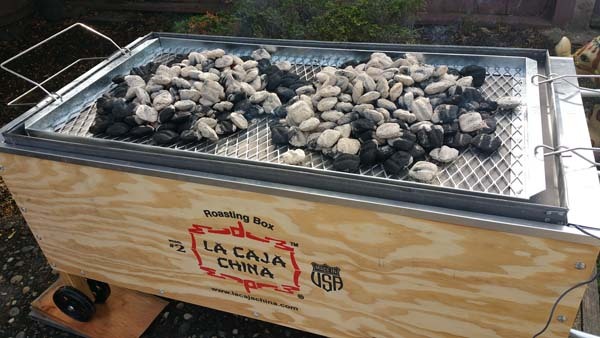 What I share is just my experience doing one cook on the La Caja China so if you want to follow my path, here’s my story. 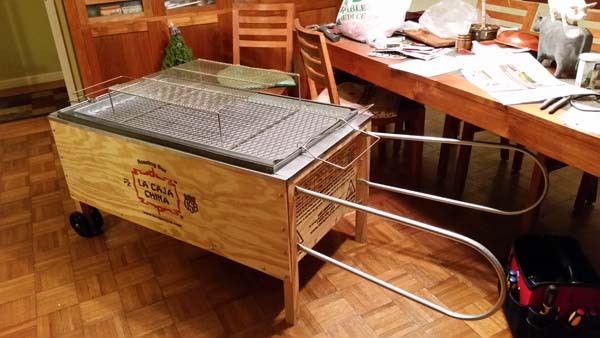 The $399 Model #2 La Caja China unit was shipped disassembled in cardboard packaging. Model #2 is for a 100 lb hog. Note that the 100 lb refers to the live weight. The pig will lose a third of the weigh after the pig is dressed. There are also 18 lb, 70lb, and 200 lb models available. I chose the 100 lb model as you can cook a lot of pig in it, or several turkeys, chickens, whole lamb, and so on. Assembly was straightforward with about three dozen wing nuts used to make the box. The charcoal grate, charcoal pan, and drip pan come fully assembled. Tip: Don’t tighten all the wingnuts initially as it’s easier to get all the wing nuts in finger-loose and then tighten them all in an opposite cross-pattern, finger tight first, then final tightening using pliers. Visualize how you would tighten the nuts on your car tire. You screw on all the nuts on finger-tight first before you tighten them in a cross-pattern where you tighten the next nut that’s furthest away from the one you just finished. This allows for an even pressure to get the wheel on the axle. Ditto for the roaster to minimize leaks. 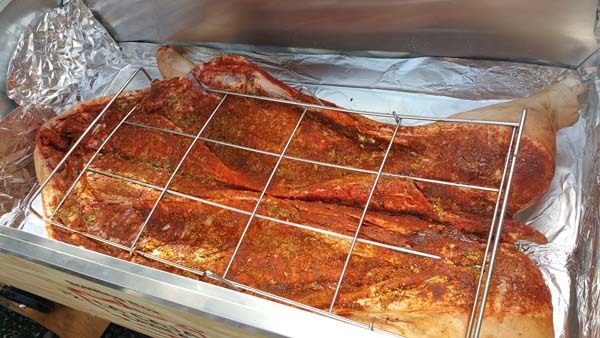 The unit consists of a charcoal grate, rectangular charcoal pan that is also the roaster box cover, two wire frames to hold the pig via S-hooks and to make it easy to flip to crisp the skin, and a rectangular drip pan at the bottom of the roaster box. I purchased the matching grill rack because what else is there to do when the pig is cooking than to cook your appetizers and snacks. The moving handles also double as a platform where you can place the hot charcoal pan and grate when you flip the pig after the ham reaches about 195F. Tip: Before you cook, line the insides with aluminum foil. The roaster box is not water tight so any grease that is not caught by the drip pan will leak out. The drip pan is a bit smaller so if you cook a 70 lb dressed-weight pig like I did, the pan will not catch all the cooking grease. This grease will end up at the bottom of the roaster and leak out onto your grass or patio. I used the empty Kingsford bags to catch any grease leaking onto the patio floor (see picture). 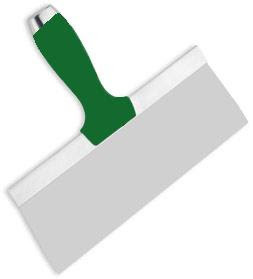 Tip: The metal edges are unfinished and are sharp so be very careful. Tip: Ensure the roaster is level so it cooks evenly and there is no uneven pooling of cooking liquid in the roaster. See the wood shims in the picture below. 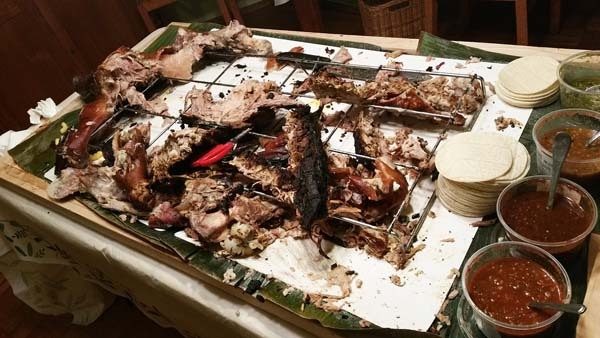 Tip: For safety reasons, DO NOT cook the pig by yourself. You need two persons to safely manhandle the pig through the cooking process and whenever you need to remove the charcoal grate and pan. I have heavyweight welder’s gloves from Home Depot to protect my hands from the heat. Tip: For safety reasons, keep young children away from the roaster as the hot coals are exposed. If you are doing this at a party where there are young children of guests or family present, be sure to rope off the cook area and have an adult “lifeguard” watch the roaster at all times. In 2009, I watched in horror as a rookie team cooking beside me at a contest had a nasty accident. They were preoccupied and their toddler accidentally sat on hot coals and her diaper caught on fire. Tip: Be very careful with the lifting handles as they are not permanently attached to the charcoal grate nor the charcoal pan. Consequently, they come off easily. When the charcoal is lit, the radiant heat is intensely hot so it’s challenging to try to reattach the lifting handles if they come off without being scorched. 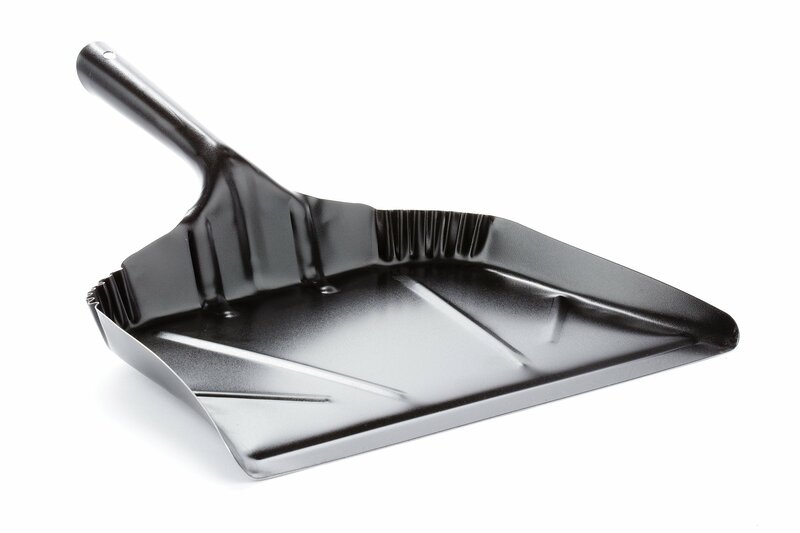 Tip: have a metal drywall mud scraper and metal dustpan handy to remove ash buildup from the charcoal pan. I used Kingsford Blue which has a lot of clay in it so there is a lot of ash that acts as an insulator which slows down the cook. This is especially important when you have flipped the pig and are trying to crisp the skin. Any ash on the charcoal pan cover will compromise the broiling action and you won’t get that crunchy Chicharones crispy skin on your pig. Where to find a pig? I started with 70 lb dressed-weight pit from Don’s Meat Market in Oakland which so happens to be the butcher shop owned by the father of my fiancé pitmaster Donna Fong (Butchers Daughter BBQ of Alameda). The original live pig was about 100 lbs which resulted in a 70 lb dressed-weight after the viscera was removed. Figure that you will get 70% of the weight of a live pig after it is slaughtered and prepared. Of the 70 lbs raw pig, I reckon I got about 50 lbs of cooked pig when I was done. TIP: So remember Harry’s 100-70-50 rule when cooking whole pigs. I’m no Einstein but my brain breaks it down as follows: a 100 lb pig results in a 70 lb dressed pig and 50 lb cooked pig meat. 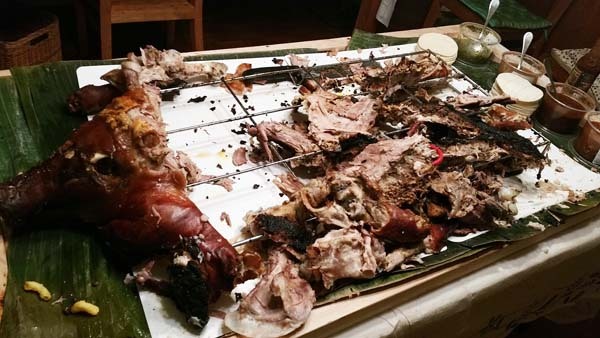 And, 50 lbs of pig meat will feed 100 persons (or 2X ratio of 2 guest per pound, or 8 ounces each guest). Simple? This worked out as we had about 70 at the party and there was about 30 portions of pig for our happy guests to take home (i.e., total of 100 portions from 50 lbs of pig with 8 oz per serving). Pork is a contest entry I cook well finishing third in the nation in 2011 in the KCBS Pork Team of the Year so I have a good feel as to how rub and injection recipes can be fine-tuned for a championship result. I started with the La Caja online recipe for a Cuban mojo and modified it. I did not have time to let it sit overnight so I cooked it about an hour after injecting. Inject the pig in 1 inch intervals and be sure to get the injection deep into the meat. I used a bottle of my SYD All Purpose Rub to season the insides. This rub has helped me win 1st place pork numerous times. The final flavor was very good according to our guests. Do not get any rub onto the skin side. TIP: I cut off the shank and forearms as those were saved for stock and I used an axe and hammer to split the pig along the spine. This allows the pig to sit flat in the cooking frame. 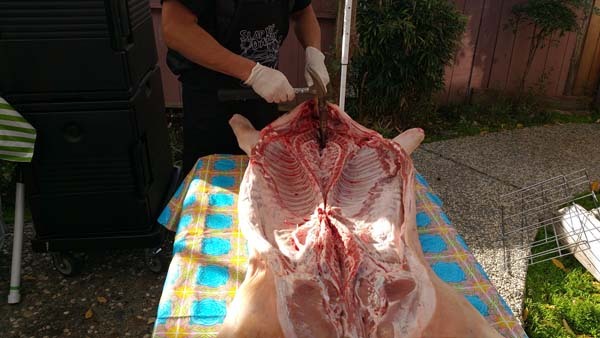 TIP: To handle the pig during prep, I used a 5 foot folding table and vinyl tablecloth to aid cleanup. 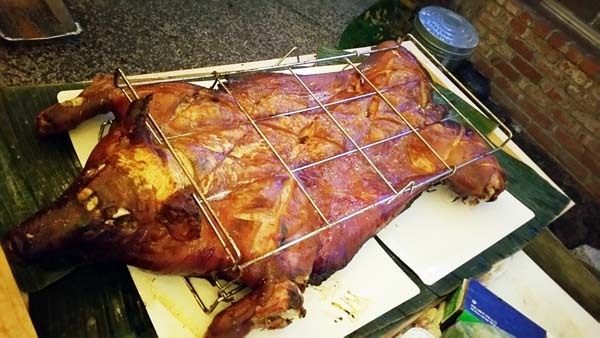 Be sure to put the rectangular wire frame on the table first before you put the pig on skin side down. 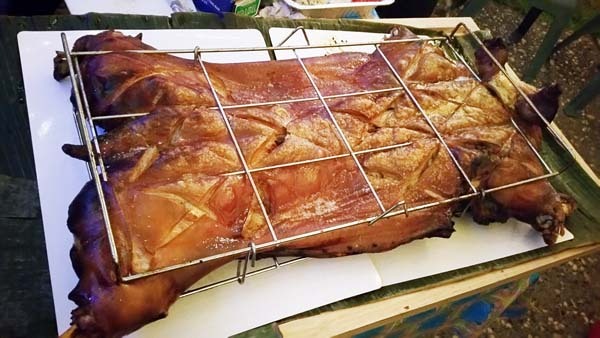 Once you finish injecting and then applying the rub, you place the second rectangular wire frame on top of the pig and fasten the two frames together with the provided S-hooks. If the pig is too thick for the frames to come together close enough to clip on the S-hooks, you can make an incision in the pig flesh to let the frame sit in the cut so the two metal frames can be clipped together. Tip: Wait until pig internal temp is up and closer to room temp. I waited about 1 hour after I injected and rubbed before I put the pig in the roaster. If the pig is too cold or frozen, it will cook unevenly. After you inject and rub the pig, have a friend help you pick it up to place it into the roaster skin down. Place the metal roaster cover on and then the charcoal grate. Take an 18 lb bag of Kingsford Blue and fill your Weber charcoal chimney. Dump the rest into two mounds on the charcoal grate. TIP: I chose not to put any hot coals in the middle since the belly area has little meat and I did not want to overcook the rib and belly areas. The shoulder and ham areas can take more heat and the middle of the charcoal grate had little or no lit briquettes during my cook. Fill and light 1 full Weber chimney of briquettes. Dump the remainder of the 18-lb bag into two half mounds. I like KF Blue because it’s price efficient (read cheap) as it’s on 2-for-1 sale in the summer months. It also burns very consistently from bag to bag. The downside is there is a lot of clay in the product so you will have a lot of ash which you need to dispose of. After about 45 minutes, I added more briquettes. Repeat every 45 minutes or so. For my 70 lb pig cook, I used to total of two 18-lb bags for my 4:30 cook from start to finish. Tip: Lift the metal protective piece on the narrow end of the box so you can run your thermometer cable under the metal piece. It took about 3.5 hours before my probe thermometer stuck in the ham beeped at 195F signaling that the pig was done. I was quite amazed it was so fast and easy despite the 50F ambient cloudy weather. At the 3.5 hour mark after my probe registered 195F in the ham, it was time to flip the pig to char the skin. You need a helper to do this so don’t try this yourself. Once you flip it, you score X’s on the skin where the wire frame is not touching. Sprinkle some salt onto the skin side. It took me another 45 minutes to crisp the skin to a beautiful brown color. I took a peek at 30 minutes and it was not done so I went another 15 minutes. Total cook time was about 4:15. About 3:30 to get the ham to 195F and another 45 minutes to get perfectly crispy skin. A couple of days before the cook, my better half went to Home Depot to get some plywood to build a 4’ X 2’ table to hold the pig. I lined the “serving platter” with some banana leaves and disposable cutting boards. We use some store bought salsa and street taco sized corn tortillas. We had a pitmaster friend Tracy Anderson from Woodhouse Barbecue serve our 50 guests. The best part IMHO was the belly bacon and the jowls. Overall, every part of delicious and when you have half dozen Grand Champion pitmasters in the guest roster, what they say really matters! The pig went fast and there were many ooh’s and ahhh’s. By the end of the night, the pig was all gone as guest took home the bagged leftovers, and they all left themselves a standing invitation in case we wanted to cook a whole hog again. Since it was 50F outdoors and the temps dipped into the 40’s in the evening, I made sure that while the roaster was still warm that I got most of the grease out of the drip pan and used paper towels to mop up the grease at the bottom. Nothing is messier than congealed pork fat in your roaster in the morning. The ash needs to be carefully put away in an ash can to minimize fire risk. The next morning, I sprayed Simple Green all over the roaster and grates, and drip pans. After letting it sit for a few minutes, I hosed off the entire unit in the garden. I dried it with paper towels, disassembled the moving handles, and stored the unit and parts in the garage. Until the next cook, the unit will be safe and dry. I can personally attest to how well that hog turned out. It was not only pretty to look at but the crackling skin was a porky treat. I have to admit I had several servings more than I should have. I just wanted to taste every section of that beautiful pig. Thanks for the play by play procedure. 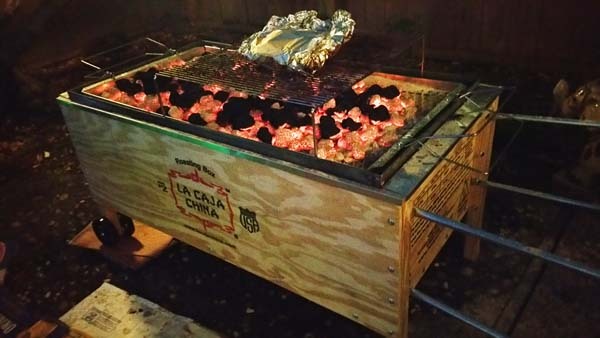 I have always have been curious of the La Caja China Pig Roaster. It definitely gets the job done. That was fun. Thanks for your feedback Paul. It was a fun cook and glad I got the guest to be involved in the cook. Harry, thanks so much for taking good pictures and writing so much detail… It makes my mouth water as I read it. Your work in writing this up, gives me confidence to try it myself. I don’t have lots of critics in the crowd so i am even better off trying this for my family. Thank you so much for your kind words. Give it a go and get some of that wonderful pork into everyone’s mouth! Good luck and send pics. This is a great write up. I used it as a guide for my first cook last year. I am now prepping for a second, but have a few questions. First, on an 80lb pig, the S hooks were not even close to big enough to secure the racks at the shoulders…any thoughts for a workaround? Is Simple Green safe on the aluminum box as a cleaner? I had a hell of a time cleaning the unit using a supposedly aluminum safe degreaser. Thanks! If the pig is too thick, you just use a sharp knife and cut a V notch into the shoulder meat so the two rectangle frames can be secured with the 5 hooks. I’m not a chemical expert and I do use Simple Green as it’s non-toxic according to the manufacturer. I use a sponge and dish soap to clean the insiders of the cooker. Be very careful as it has many sharp edges. This is the precise weblog for anybody who needs to search out out about this topic. You realize a lot its nearly exhausting to argue with you (not that I truly would need…HaHa). You definitely put a new spin on a topic thats been written about for years. Nice stuff, just great!